The last few days have been cold, rainy, and damp. Combine that with reports from the north of snow flurries and frost and I guess it’s time to face reality…. eventually. Let’s make one more visit to the tropical garden while I sit indoors waiting for things to dry out. Seedlings of this peachy-pink salvia splendens have finally come into their own along with the grasses. A garden which ends in a crescendo rather than sputtering out is my kind of garden! Second year’s a charm for this Abelmoschus Manihot. It’s an annual for me and doesn’t appreciate the dry poor soil of most of the garden. Although the size and color of the blooms is perfect, it shamefully begins to close up by the time I get home from work. Actually a green lawn just means more mowing so I guess I’ll embrace the summertime tan, but being that the autumn rains have returned, something green to set off the soon to be falling red maple leaves would be nice. 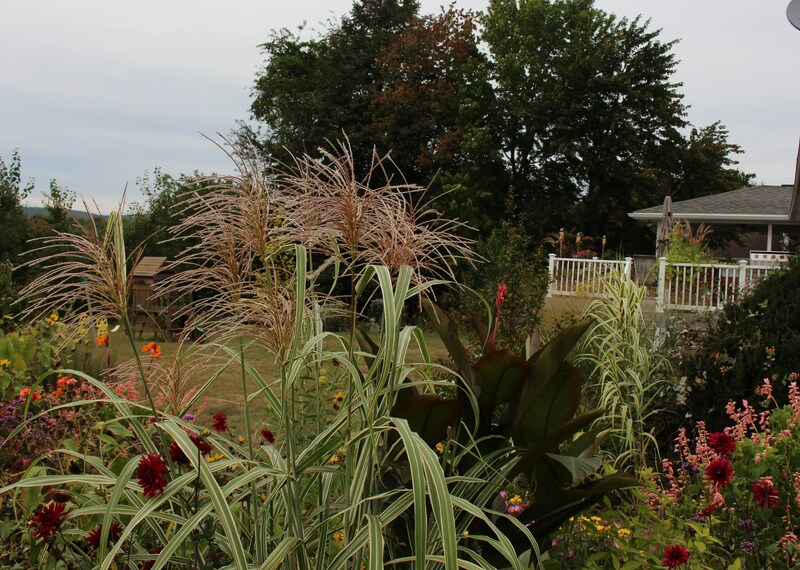 Miscanthus ‘cabaret’ in the tropical garden. This one becomes massive so I’ll need to take a spade to it next spring to keep the clump size reasonable. But cool plants don’t really need much to set them off anyway. This year time under the growlights and a little stay on the heating mat have given the swan plant seedlings just the head start they needed. Gomphocarpus physocarpus is the official name but the plant goes by several other names, all more colorful than that of ‘swan plant’. Gomphocarpus physocarpus used to be an African member of the milkweed genus (Asclepias) but somewhere along the line got booted out. Monarch butterflies disagree though and still feed on the foliage, while the flowers show off the family resemblance. The tall graceful willow-like plants are attractive enough in their own right, but the real draw for this plant are the interesting seedpods. 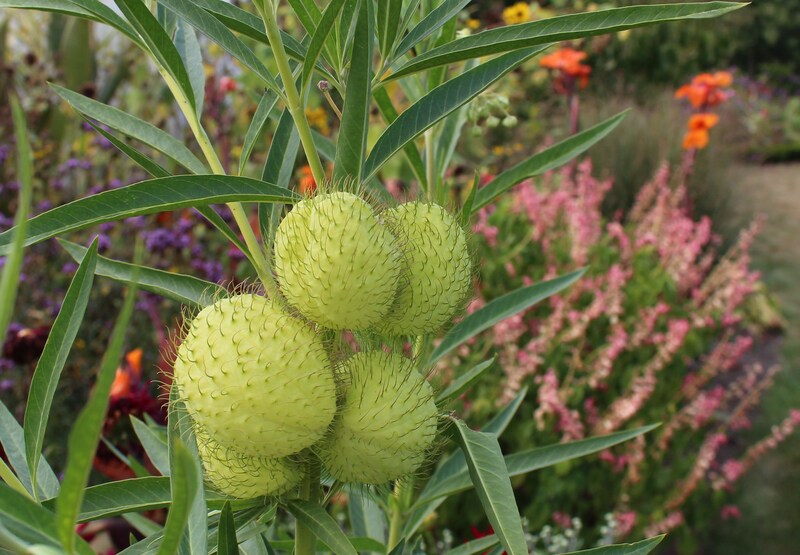 Pufferfish milkweed and balloon plant are more common names describing this feature. Pods forming on the six foot tall plants of the sawn milkweed. They always draw attention. In case you haven’t noticed, the pods seem to form in pairs and the puffiness is joined by a vegetative hairiness which leads to several other descriptive names. Since Tammy over at Casa Mariposa already broke the ice with her sure-to-make-you-smile plant support post on “All the Wobbly Bits“, I’m going to introduce the male version here, which also needs support on occasion. Family jewels plant, Bishop’s balls, and hairy balls plant are additional common names which more worldy and less discrete eyes have given to this plant. Quite a set of seed pods growing on Gomphocarpus physocarpus. A pair like this would make any gardener proud, and you could sow your seed far and wide once they’re ripe and released. 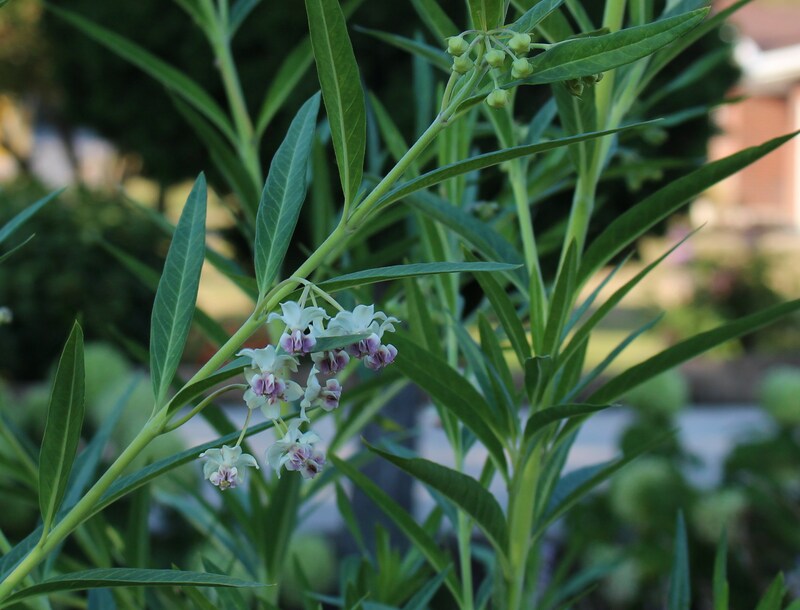 I’ve seen swan milkweed listed as a cutflower, but I’m not sure what bouquet they could find their way into (outside of a bachelorette, or bachelor-bachelor party favor). I think my best bet is to leave them out there swaying in the breeze and not bring them inside, least of all feature them in one of Cathy’s Vase on Monday posts! Dahlias in the front border. I need to re-focus on dahlias next year and give them the care they need. They’re not really a fend for themselves kind of plant! I’ll leave you with a more respectable showing of my most reliable unknown dahlia. It’s sandwiched into the rough and tumble of the front border but I feel the color goes perfectly with the aged seedheads of ‘Karl Foerster’. I guess there are some good things about the end of summer and maybe even I can finally let go. This entry was posted in annuals, dahlias, fall, Tropical garden, Uncategorized and tagged cool plants, Dahlias, exotic plants, flowers, garden, growing annuals. I can only imagine how that conversation will go…. Talk about getting to know your neighbors better! Yeah I don’t understand the whole bishop connection either. Somewhere in the day someone made the connection and I’ve got to say it worries me a little. I imagine a little old lady in a cottage garden somewhere blushing a little and then naming the thing. Loved the introduction to the Swan Plant! (I wonder why ‘Bishops’….?!) The flowers are really pretty. Enjoy these late summer days Frank, and I hope you get some time to make the most of those lovely exotic plants and dahlias before a cold night hits. The long range forecast looks promising, the nights are cool but as long as they stay above frost I’ll enjoy this borrowed time for as long as I can. I love the return of blue skies! The ex-milkweed Gomphocarpus is quite interesting as well; I like the flowers. It always takes a minute to judge your garden visitors. They either just think the pods are cool or they make the connection and don’t know quite what to say. I stick with the name swan plant though… the other names only come out if the other person starts first! I love that first shot – the salvias really work well with the other daisies and cannas. Have you noticed that almost any plant with something poisonous, unattractive or unsavoury is named after religion…whoever invented the common names for plants sure had a sense of humour! Heh heh, your comment gave me a nice laugh! -and thanks for taking the high road, sometimes you can share just a little too much online and it becomes a tad embarrassing! Your garden looks so wonderful. Enjoy it! Okay, I won’t mention the reason why I decided to cut a whole bunch of cosmos and zinnias this evening . . . I’ll tell you tomorrow if I made the right decision. I don’t think cutting an armload of flowers can ever be a bad idea, but it looks like you dodged your first run in with the thermometer! I have my fingers crossed that I can squeak out a few more days for the tender annuals… Mostly because that means I can procrastinate bringing things indoors as well. Love your first photograph, that is just how I want my border by the field to look! 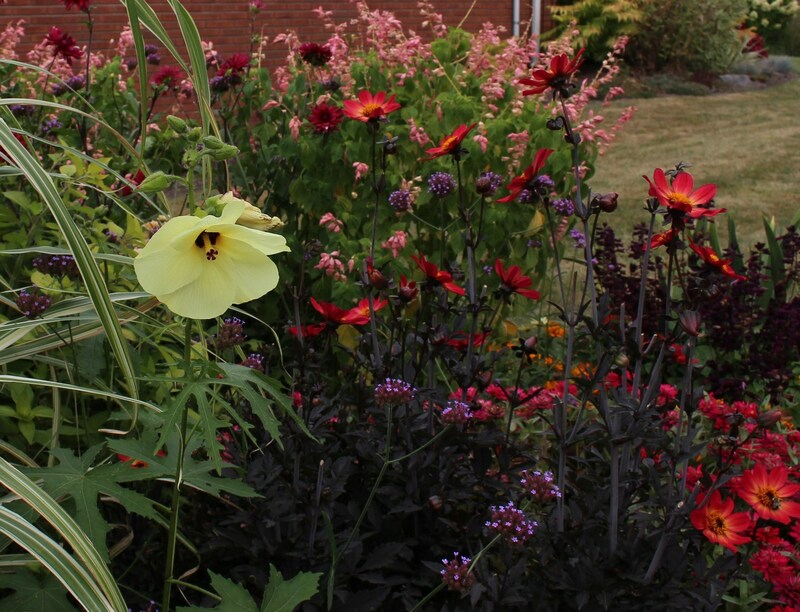 I have borders that look good in spring, summer and winter, I now just need one to be all singing and all dancing now! Thank you Pauline, I’m flattered you would say that considering how well put together your own garden is. 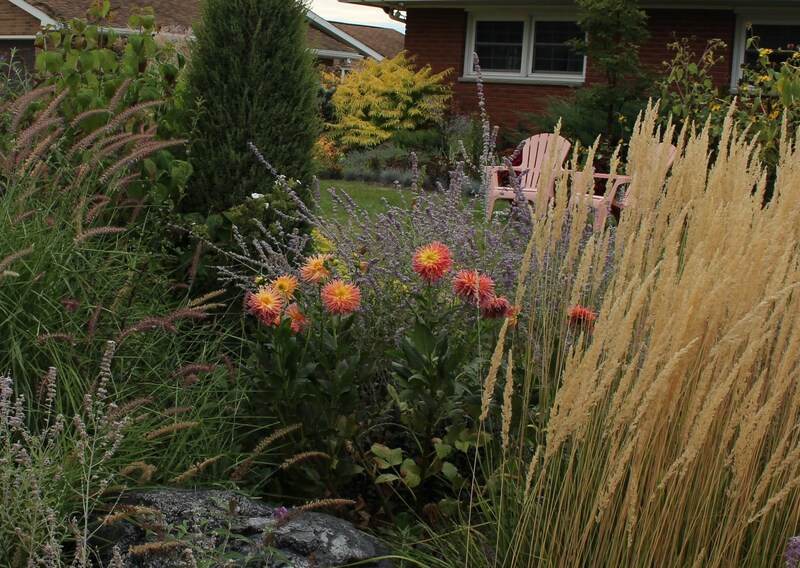 This one is mostly tropical and tender perennials. 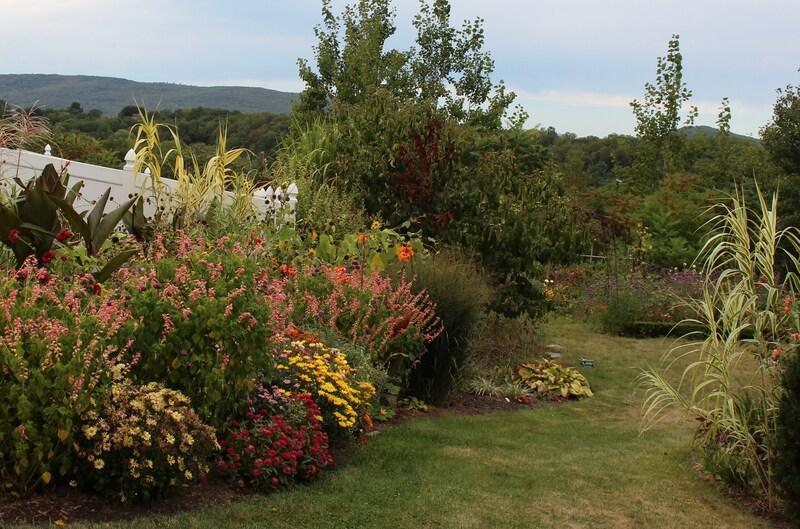 I’m eyeing a spot across the yard for some chrysanthemum and aster plantings and more of the autumn perennials. It all still looks really good, Frank, in spite of October and rain and cold! My poor garden is beginning to look tired and bedraggled at this point. I too am not ready to think about the “F word”, but I suppose I really should start to think about bringing the houseplants in for the “W word”! Every year I say I’m going to do that before I turn the house heat on, so it’s an easier transition back inside for them, and every year I seem to wait until the last minute! Perhaps your plant’s hairy balls would be a good subject for a Saturday Night Live skit, to go with Alec Baldwin’s “Shweddy Balls”! When I was visiting family over in India, I saw these growing by the side of the road. They definitely caught my attention! 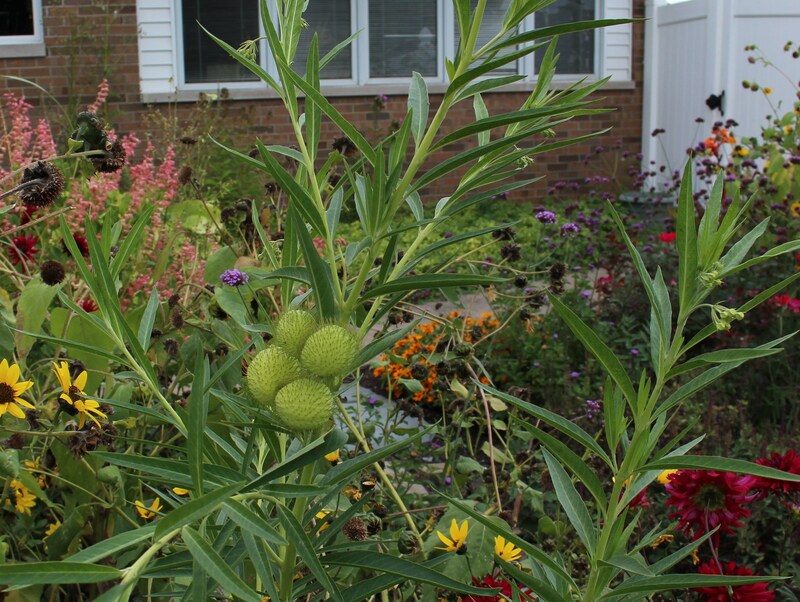 I finally figured out they were a milkweed (or so I thought). Interesting to see what the flowers look like. Definitely an attention-getter in the garden! It’s an odd plant isn’t it? I don’t think anyone will be bedding them out in mass anytime soon, but one or two are fun. Which is more shocking, the fact that you used the “F” word or the fact that you displayed your family jewels on the interweb for the entire world to see? They are lovely by the way. I’ve grown this plant before but the seeds never fully ripened so there were no future generations. Must try again! I could see these being interesting in an all green arrangement or among fall seeds and foliage. Had never heard the bishop part of the name before. Interesting. Mine didn’t make it to seeds either, We had a strong freeze a few days ago and although they’re not black and dead like every other tropical, they’re not exactly looking fresh anymore. I have a few seeds left though and might give tem another try next year, they are a fun plant!